Is the location easily accessible to the population you intend to serve? Is there public transportation, and does it run close to the site? Is there ample parking for staff and patients? Is the site near a major road or well-maintained road? Is the site centrally located to the target population? How near is the clinic site to schools (especially Title I schools)? Is the location clearly visible from the road? Do the building codes allow for the location to be used as a dental clinic? Do the land use and zoning regulations allow for a dental clinic to be at the site? 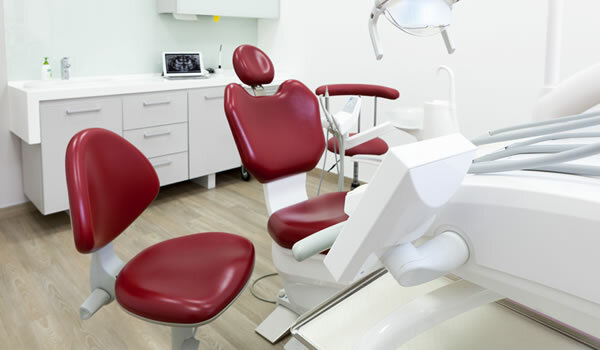 Facility size can be thought of in terms of dental chairs (operatories), square footage, or staffing. Ideally, decisions about facility size are made with regard to the target population. In reality, however, the available resources (space and funding) often determine the size of the clinic and staffing patterns. Whether you project forward from the size of the population or in reverse from the available resources, the Dental Clinic Comparison Chart at the beginning of this unit should help you. Make sure to always keep future expansion in mind. The following recommendations for clinic floor space for some of the most common clinic configurations come from the Indian Health Service (IHS). However, all plans should always keep Americans with Disabilities Act (ADA) regulations in mind. To determine the total square footage for the dental clinic, the clinic floor space should be multiplied by a conversion factor of 1.3 to allow for wall and hallway space. Space is also needed for staff lockers, staff toilets, and an employee lounge, but these are not listed in the following table, as they may be located in the general facility space if the dental clinic is co-located with a medical clinic or in a school. If the clinic is a stand-alone dental clinic, a staff lounge of at least 120 square feet will be needed. Additional space may be needed, depending on the number of staff at the facility. Lockers for staff items such as coats, hats, and purses are needed and can be placed in the staff lounge or a separate room. The size of the staff lounge and the placement of lockers is a local decision. There should be a designated restroom for clinic staff. Clinics with a staff of six or fewer members can save funds by using a unisex staff restroom. Restrooms require approximately 50 square feet. Panoramic X-ray 30 sq. ft.
Clean-up Alcove (2 to 3 operatory clinic) 90 sq. ft.
Clean-up Alcove (4 to 8 operatory clinic) 100 sq. ft.
Clean-up Alcove (9 to 12 operatory clinic) 150 sq. ft. Laboratory (2 to 3 operatory clinic) 60 sq. ft. Laboratory (4 to 8 operatory clinic) 80 sq. ft. Laboratory (9 to 12 operatory clinic) 120 sq. ft.
Darkroom (2 to 8 operatory clinic, one automatic developer) 60 sq. ft.
Darkroom (9 to 16 operatory clinic, two automatic developers) 90 sq. ft.
Unit Supply Area (2 to 3 operatory clinic) 40 sq. ft.
Unit Supply Area (4 to 8 operatory clinic) 80 sq. ft.
Unit Supply Area (9 to 12 operatory clinic) 120 sq. ft. Reception Area (1 to 4 operatory clinic) 100 sq. ft. Reception Area (5 to 8 operatory clinic) 120 sq. ft. Reception Area (9 to 16 operatory clinic) 240 sq. ft. Dental Director's Office 120 sq. ft. Dental Office Manager's or Dental Assistant Supervisor's Office 100 sq. ft.
Non-Supervisory Dentist's Office (add 40 sq. ft. for each additional dentist) 80 sq. ft. Waiting Area (1 to 4 operatory clinic) 120 sq. ft. Waiting Area (5 to 7 operatory clinic) 180 sq. ft. Waiting Area (8 to 13 operatory clinic) 240 sq. ft.
Janitorial Closet 40 sq. ft.
*Use the following conversion factor to express in square meters, as required by the federal government for its construction projects: 10.76 square feet = 1 square meter.